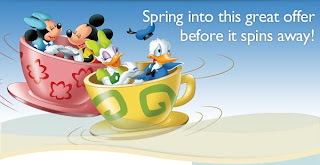 It's springtime at the Disneyland Resort, and although I'm super-sad that they did not host the California Food & Wine festival this year, they've got a lot of things coming in the summer -- Mickey's Soundsational Parade, the reopening of Star Tours, the new Ariel ride, and the renovated Disneyland Hotel. Even better, they are still offering great off-season hotel rates at the Disneyland Resort if you book by May 28. You can save up to 25% at the Grand Californian, up to 20% at the Disneyland Hotel and up to 15% at Paradise Pier, for stays until June 18. Note, one of the summer's biggest new attractions, Ariel's Undersea Adventure at Disney's California Adventure, is opening June 3. So if you act fast, you can enjoy Disney's summer attractions without having to endure the summer heat, summer prices or summer crowds.